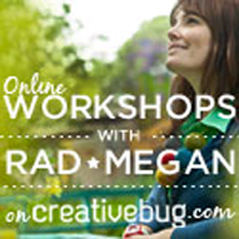 I had the pleasure of teaching at Craftcation earlier this month. In addition to my DIY Lightbox class, I had the privilege of introducing a group of awesome students to my handmade knitting forks. We had a blast crafting at cocktail hour, making these super fun beer coozies. I wanted to share the project here, and mention that I have a VERY small batch of knitting forks ready to sell. Follow @radmeganofficial on Instagram for details on that. Anyway! 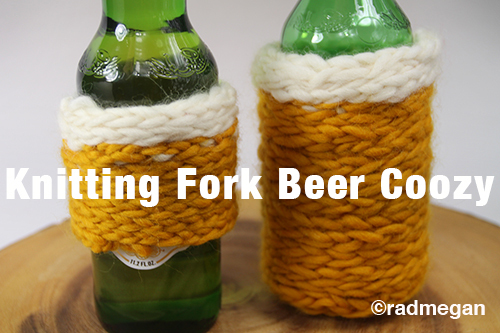 If you already have your radmegan knitting fork, here’s how you make a beer coozie. 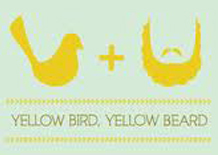 Use this video, your knitting fork and yellow wool yarn to get started. Use the second method of wrapping I show in the video(where you rotate the fork in your hand) to make a looooooong cord. 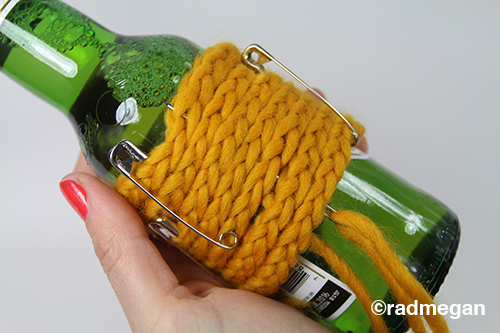 Wrap the cord tightly around your beer bottle until it covers the same amount of real estate as your four fingers do when holding the bottle. 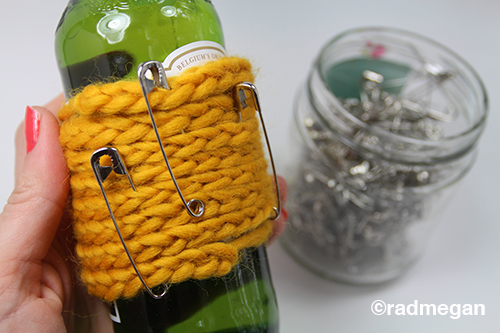 Use the safety pins to keep the stacked cord snugly in place. 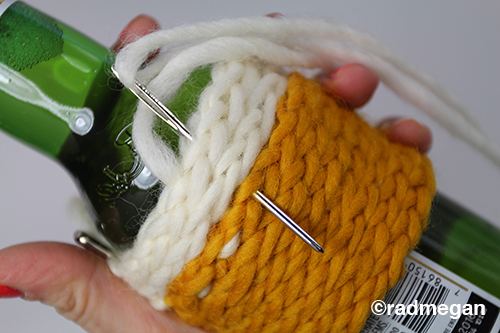 Insert the needle into the middle of the stitches of the top cord, and push it all the way through to the bottom of the stacked cords. 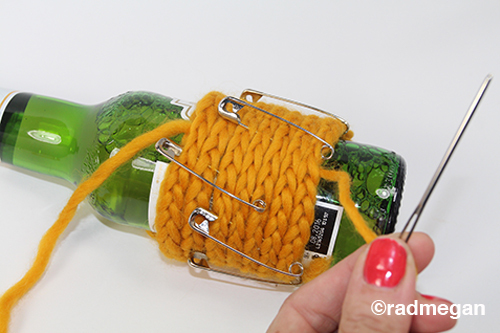 Be sure you are inserting your needle through the centers of each of the cords as you work your way down the bottle. 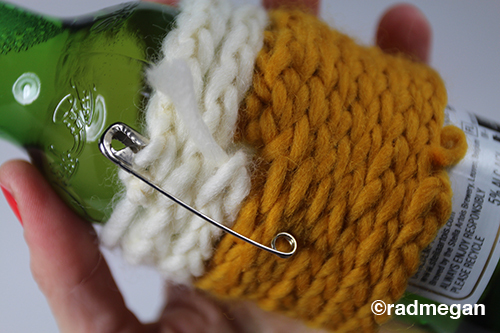 Pull the yarn-threaded needle tightly, then insert the needle through the center of the cord near where your needle just exited, and work your way back up the bottle, through the centers of the cords again. 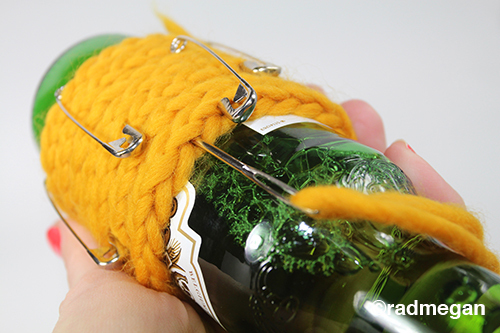 Continue stitching your way around the bottle, removing the safety pins as you sew the wrapped cords together. 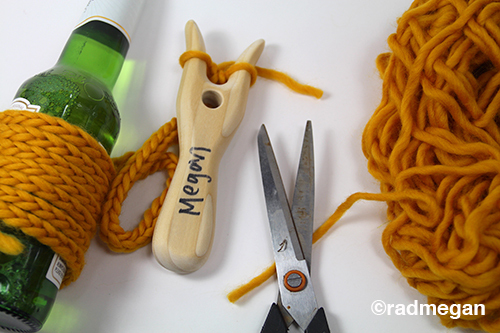 When the yellow stacked cords are completely stitched together, tie a knot in the end of the yarn and snip the ends. You can weave the tail pieces in when you are done. 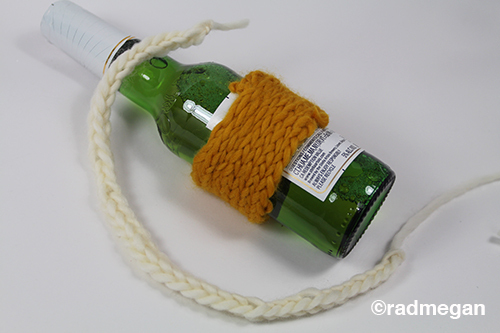 Now make a second, smaller length of white cord using your second color of white yarn. Wrap it around the bottle as many times as you want. (This is the foamy head of your beer, so if you like the look of lots of head, make a bunch of cord. 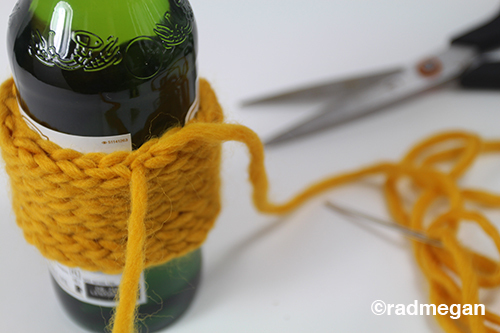 If you only want a hint of it, make a short cord. Pin the white cord in place and secure it to the yellow. 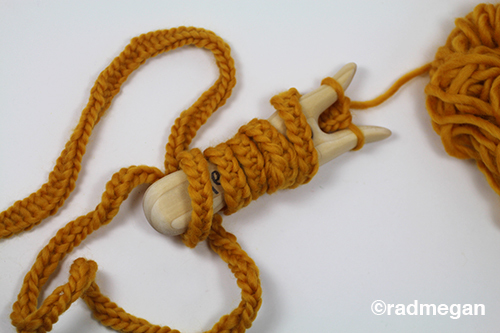 Thread the darning needle with white yarn, and stitch the white cords in place, AND down into the first row of yellow cord to attach the two colors together. 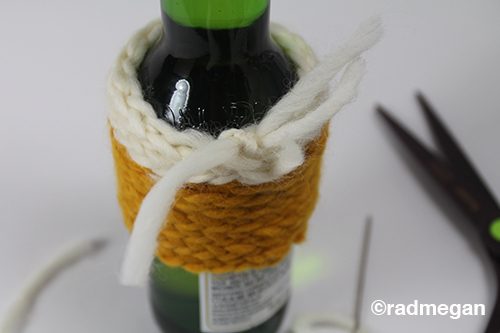 Tie off the white yarn, and weave the ends into the inside of the coozie sleeve. As you use your coozies with cold, and sweaty beers, the moisture and friction will gently felt the inside of the coozie. 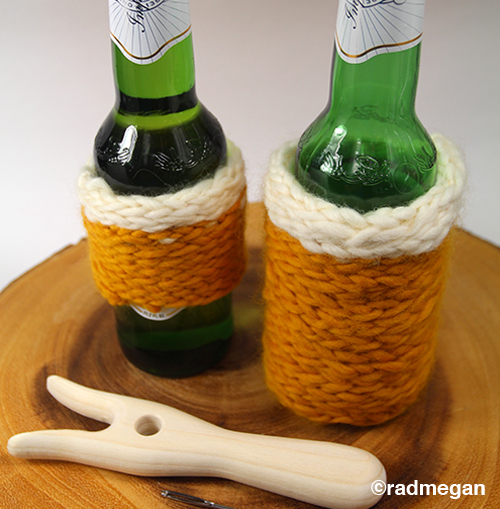 If you want to make a coozy with a bottom (like the one pictured below on the right, make a very looooooooong yellow cord, and begin by coiling the bottom into a tight circle, and pinning it in place, then extending the cord up the sides of the beer bottle as you did in the example above.